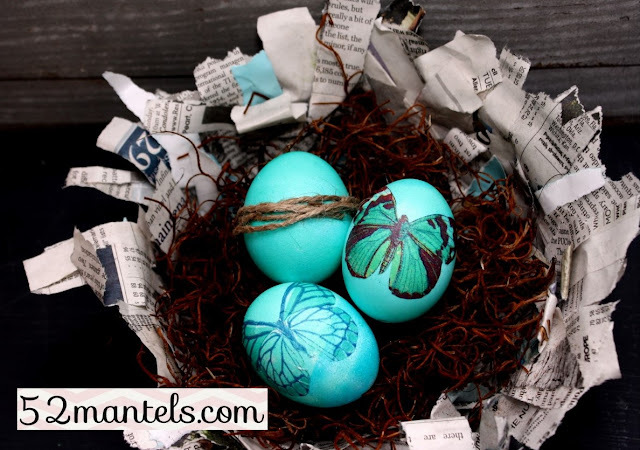 I shared this tutorial over at It's Overflowing during Aimee's Easter Egg Hunt Series. If you need a whol'buncha more Easter egg ideas, hop (get it? hop? like an Easter bunny?) on over to Aimee's and check them out! I was so inspired by all the creative ways to decorate eggs! But, before we get crackin' (get it? crackin'? like an egg?) on this tutorial, I've got to tell you that, yes, my porch makeover won round 3 of American Crafter, meaning that I am in the finals! This Friday you'll get to see my last project and then you'll get to vote over the weekend. Are you all a-tingle with excitement?? You and me both, friends. You and me both. Alright, enough about that, you're here for eggs. And, eggs you shall see. 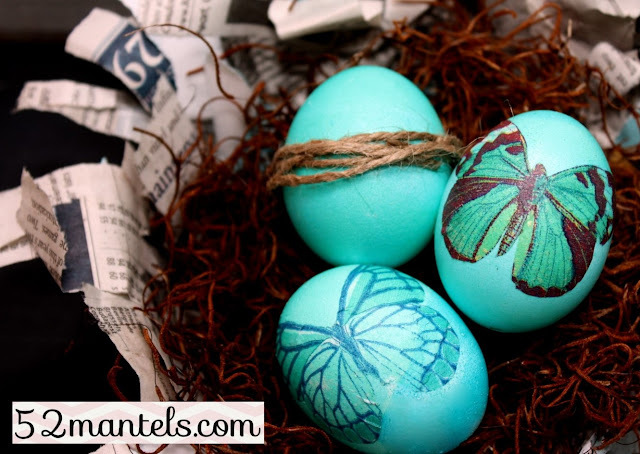 With these eggs, I decided to decoupage a design on them using pretty, Springy napkins I picked up at Tom Thumb. The process is simple. I started with blown-out eggs because if I'm going to decorate eggs, I want to enjoy them all all season! 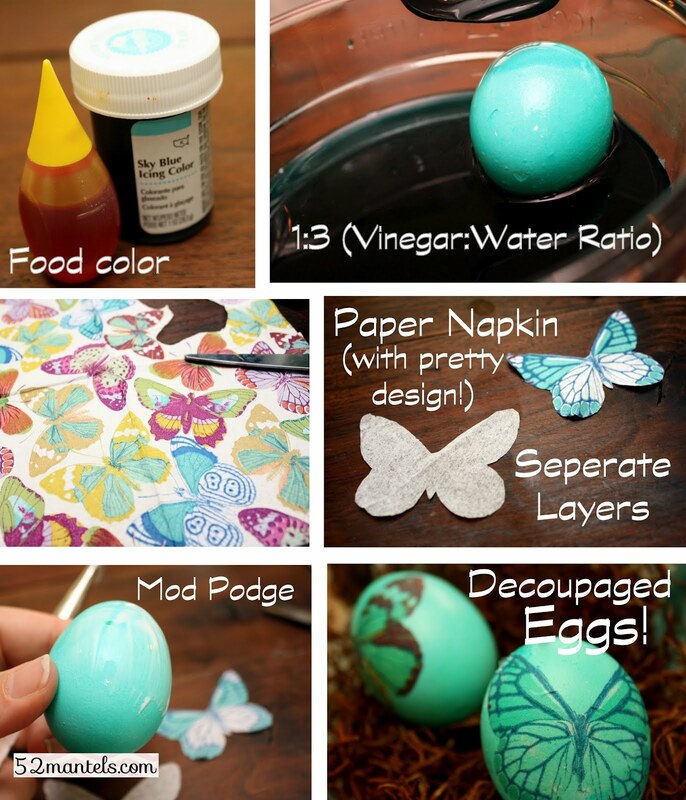 There are so many great tutorials on how to blow-out eggs, I'll skip right to the dying and decorating! I used food color for my dye, but if you're involving the kids in this project, you might want to use a dye that doesn't stain like food color. I wanted them to be a pale turquoise, so I used sky blue with a touch of yellow. One dip rendered them a bit darker than I'd intended, but I didn't mind! 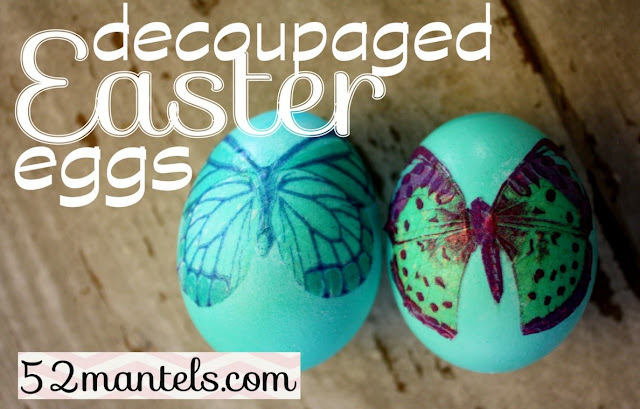 After the eggs were dyed and dried, I used mod podge to decoupage a design on them. I simply cut my desired design from a napkin and separated the layers so that I decoupaged a single layer only. After they were dried, I used them to create pretty, seasonal vignettes around my house! I think these would be great on a tablescape, perhaps even used as place-card holders! And, because they won't spoil, I can decorate with them until Easter! Lots of bang for very little money and not a lot of time....my kind of project! For the Jute-wrapped eggs...well, that about sums it up. I wrapped them in a length of jute and dabbed mod podge around the ends to keep the jute in place. Easy as can be!! Have an egg-cellent day (oh, I just couldn't resist!)! These are so pretty! Had no idea the butterfly was cut from a napkin! darling!! really beautiful - well done & nice directions to boot! Too cute! 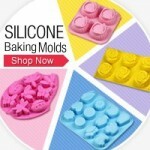 And super simple (except for the blown out part -- I just can't seem to get that right without getting frustrated!)... you're right that they're perfect for a tablescape. Love these - they are egg-stremely fabulous (sorry - I couldn't resist being just as cheesy)! These are just so adorable! I LOVE the color just for starters! It's my fave! :) Thanks so much for sharing. Yes! I'm so glad that you won last week...your project WAS the best one, no doubt. Love the decoupaged eggs, they are just beautiful. Your eggs turned out beautifully and I love the newspaper basket. You're full of such fun ideas! I'm getting excited to do eggs reading this! Thanks so much for hosting Emily!! These eggs look so cute. I love the decoupage idea. Thanks for sharing. Emily, Happy Monday! Your Easter eggs are included on my list of 101 Things to do with an Easter egg today! Come by and have a look! These are adorable. I just love the blue color and especially the butterflies. I just made my own unique eggs too. I would love for you to come over and check them out! 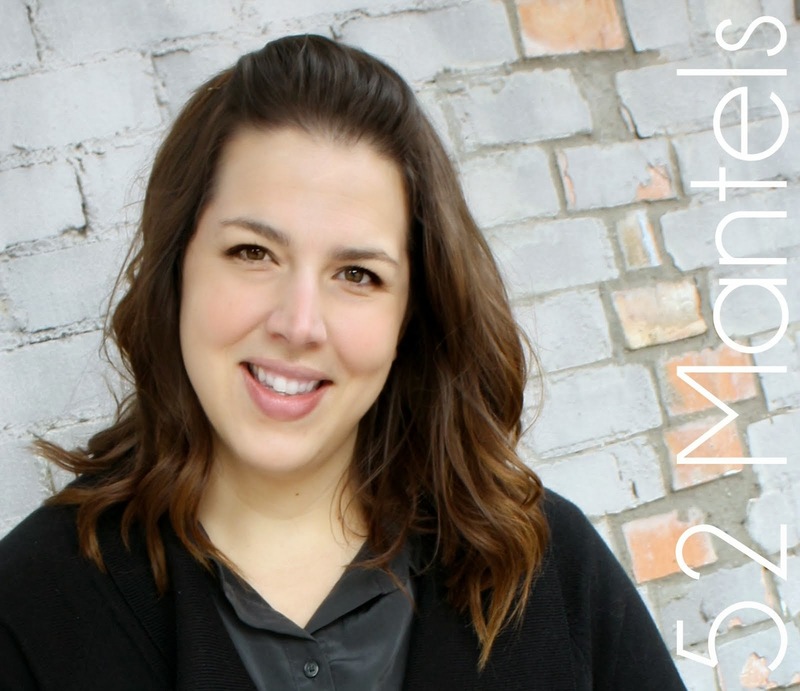 Another awesome idea from 52 Mantels! This is so very beautiful! I love the blue color and even the cute nest you made! I would love if you would link these up on my weekly Destination: Inspiration party. I am a big fan of your blog! Love the blue... featuring them tomorrow!